Countless books have been published on the historical sites of the Hudson River Valley. But these books have focused over and over again on the best-known, best-preserved places. Every bit as valuable are dozens of other historical sites that haven't fared as well. Many of these buildings are listed on the National Register of Historical Places, and a few are even National Historical Landmarks. But in spite of their significance, these structures have been allowed to decay, and in some cases, to disappear altogether. In an effort to raise awareness of their plight, Hudson Valley Ruins offers the reader a long-overdue glimpse at some of the region's forgotten cultural treasures. In addition to great river estates, the book profiles sites more meaningful to everyday life in the Valley: churches and hotels, commercial and civic buildings, mills and train stations. Included are works by some of the most important names in American architectural history, such as Alexander Jackson Davis and Calvert Vaux. The book is divided into four parts that correspond to the upper, middle, maritime, and lower sections of the Hudson River Valley. Sites have been selected for their general historical and architectural significance, their relationship to important themes in the region's history, their physical condition or "rustic" character, and their ability to demonstrate a particular threat still faced by historical buildings in the region. The Dutch Reformed Church at Newburgh tells the story of the Valley's oldest religious group; the Luckey Platt department store in Poughkeepsie was for decades the "Leading Store of the Hudson Valley"; and the ruins of the West Point Foundry at Cold Spring are all that remain of what was once one of the river's most important industries. Taken together, these places present a broad picture of the region's past that is relevant to its present and future. This book was published with the generous support of Furthermore, a program of the J. M. Kaplan Fund. 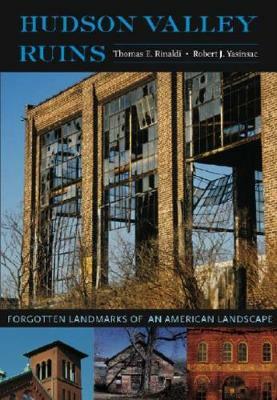 "[Hudson Valley Ruins] takes a middle road between the extravagant picture-book of erstwhile luxury estates and the scholarly architectural catalog, giving overviews of endangered sites by region, and telling in detail the life stories of several properties in each area. The 'ruins' encompass not only empty mansions but also the detritus of commerce: cement mines, gargantuan icehouses, the submerged hulks of steamboats, even an early electric-power station. These histories are individually riveting and cumulatively alarming. One rushes through these place-portraits to find out whether the architectural protagonist makes it in the end, or dies owing to neglect or ruthlessness. Hudson Valley Ruins reminds us of the callous disregard of the future for today's wealth and power, no matter how grand. One may keep up with the Joneses, perhaps, but not with the onslaught of time." -- "Newsday"
"Up and down the Hudson Valley region lie countless abandoned buildings, slowly rotting and decaying over time. These old factories, homes, schools, train stations, and more have long since been forgotten, or, if they haven't, are currently being remodeled or torn down. Hudson Valley Ruins brings these places back to life . . . For each site, the authors include a detailed history of the location and outline its current condition. The authors' text reveals the extensive history of New York; it also underlines the importance of these buildings and the authors' hopes for their restoration and preservation . . . Recommended." -- "Library Journal"